Right about now, my husband and I (lovingly?) start referring to the Pacific Northwest as "The Frozen North." We are not originally from here, so our blood is naturally thinner and our constitutions naturally weaker. We are weather wimps. Therefore, we look for winter crutches. We seek out things like puffy jackets and furry slippers. We also go through a fair amount of chili. We've made a few different recipes, but this is our favorite! Justin found and adapted the recipe, so we call it Husband Chili. 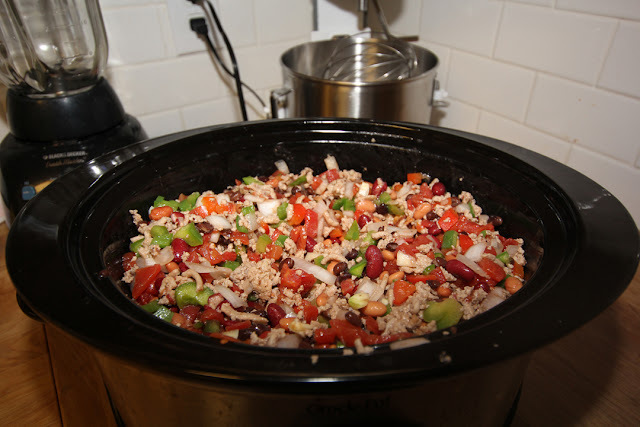 We make it in the crockpot overnight - super easy and really delicious. Last time we had this, I made some skillet cornbread to go with it. 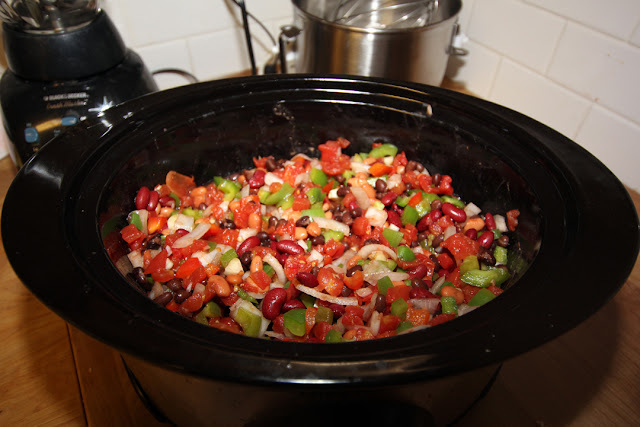 Add all of the chopped bell and hot peppers, onions, water, beans, tomatoes and garlic to the crockpot and cook on high for 30 minutes. Meanwhile, brown the meat and then add it to the crockpot. Cook for 30 more minutes. Add all of the amazing spices and the vinegar and stir well. Turn down to low and cook for at least six hours... and even overnight. The picture below is after about 7 hours. All of the veggies are nice and soft and the flavors have combined and the sauce is rich and delicious. 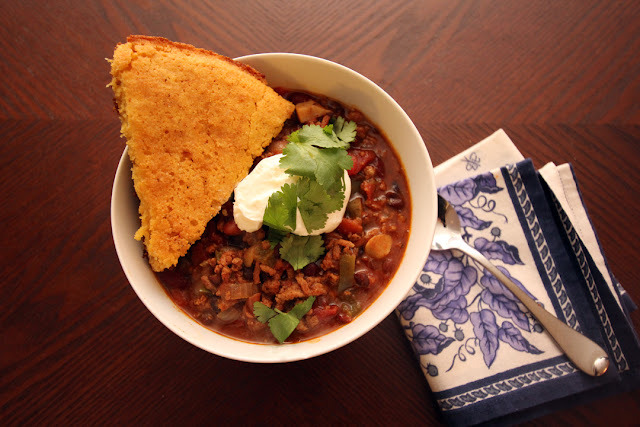 When cooked overnight, the chili gets much darker, spicier and it's harder to pick out the separate ingredients. Totally delicious, but different than these pictures. We were hungry. Stir together flour, salt and baking powder in a large bowl. 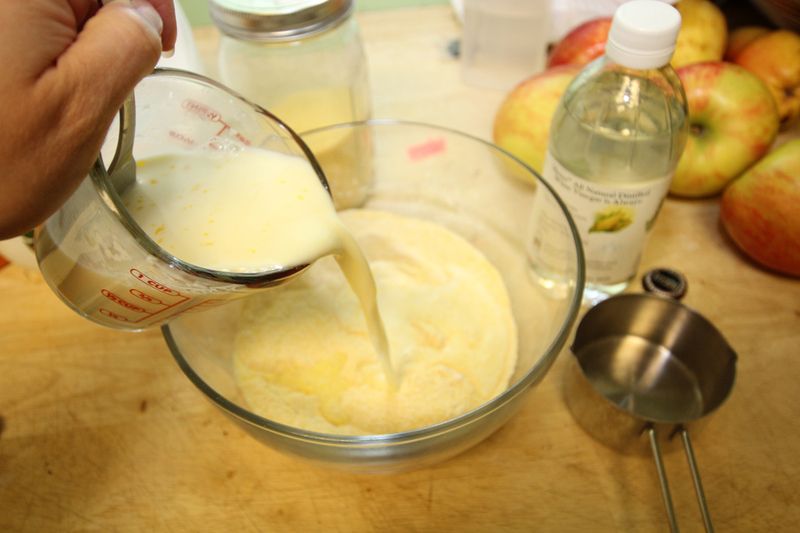 In a separate bowl, or large enough measuring cup, combine buttermilk, milk and egg and mix to break up the egg. Add the baking soda and stir again. Add milk mixture to cornmeal mixture and stir until just combined. In a small bowl, or pan, melt the 1/4 cup of shortening and stir in the honey. Add to the batter and stir until just combined. Melt the 2 tablespoons of shortening in an iron skillet over medium-high heat. Pour the batter into the hot skillet and spread out to even it a bit. Cook on the stove for 1 minute and then bake for 18-20 minutes. I used a 12 inch skillet, so my cornbread is thinner and cooks faster than if you use a 10 inch skillet. Flip out and enjoy another upside-down dish! We cut the cumin and chili powder down from the original recipe by almost half. The original was too spicy for us, and we like spice! If you are really into spice, you may want to up the spices again, or add some hot sauce at the end. This is super flavorful and pretty picante, but it's not crazy as we cook it now. We've used beef and turkey - both are great! Beef tastes "heartier." The Pioneer Woman doesn't use honey in her cornbread. I like just a touch of honey baked in to take away some of the bitterness I find in cornmeal. And... 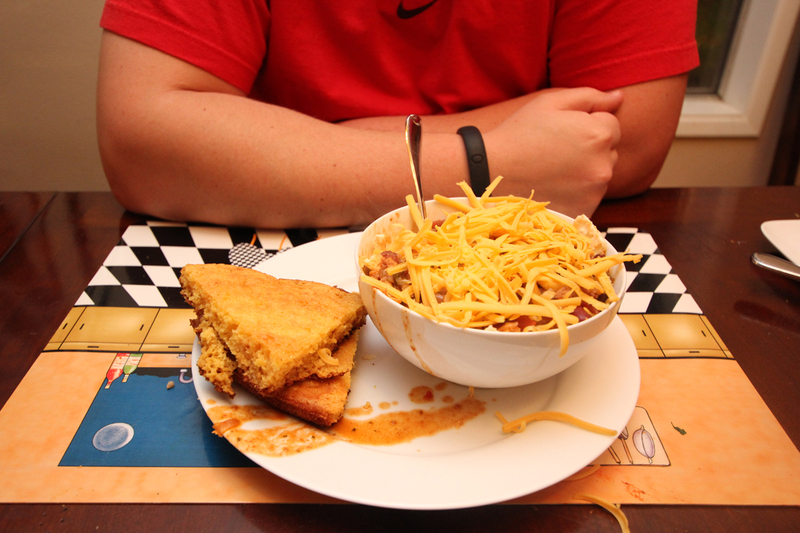 I know the first picture is pretty and the napkin is all clean and nice, but here's how we usually eat chili. Like the cartoon, foam place mats? So does our baby. Like the sloshed around plate my husband carried to the table while he carried a baby in the other arm and scooted a highchair around with his toe? Super chic, right? It's totally Pottery Barn spread up in here. Enjoy!